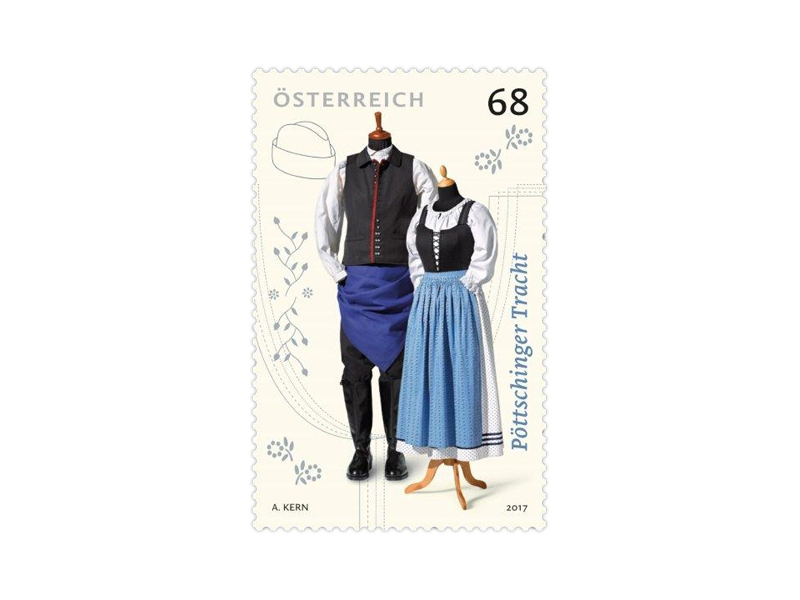 For the “Classic traditional costumes” series it is, on this occasion, the traditional costume of the municipality of Pöttsching in the north of Burgenland that is to be presented. This traditional costume’s origins can be traced back to the traditional folk costumes of Burgenland and the musician from Pöttsching, Peter Zauner. Among other things, Peter Zauner was a violinist under Carl Michael Ziehrer and also a composer: he wrote the melody for the regional anthem for Burgenland. After the First World War he founded the Pöttsching brass band. In 1928 a large musical festival was organised in his home region, at which Zauner and his band appeared for the first time in the traditional costume of Burgenland, and where traditional songs and folk dances were performed with great success. Thereafter it was decided to include folk music and dances in the national education and thus to ensure that these traditions survived for future generations. 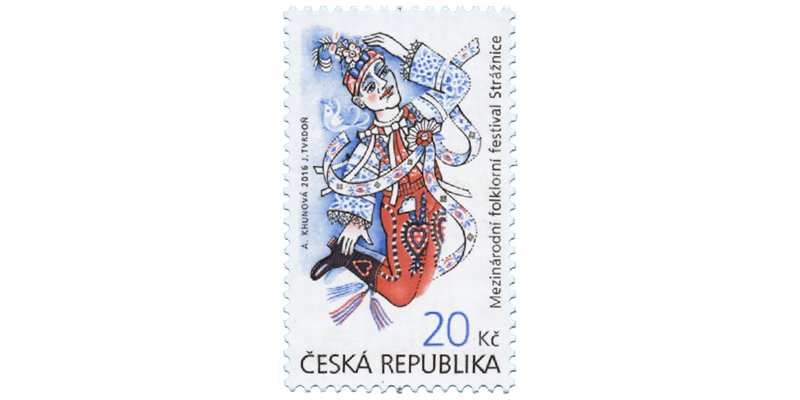 Even today, folk dance and music continue to be accorded great significance in this little municipality, with a musical clef even being included in its coat of arms. 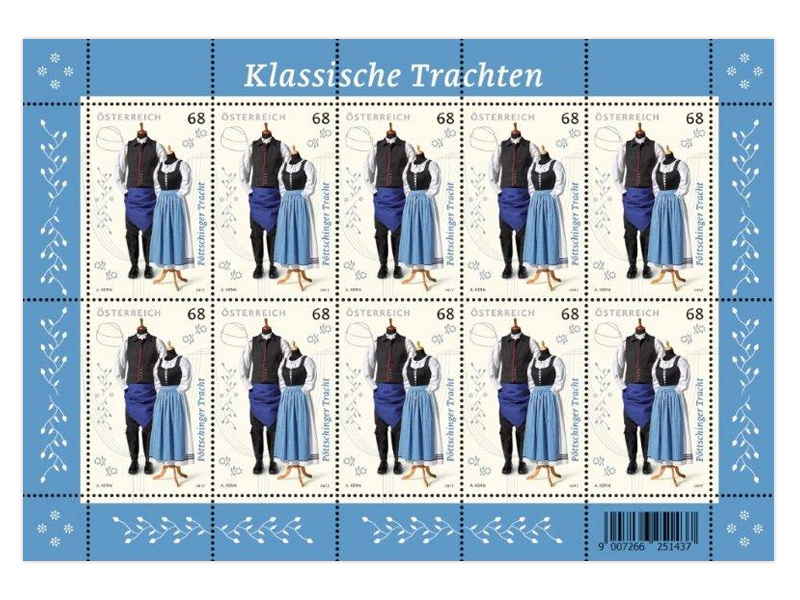 1980 and 1981 saw the first performances of folk dance at the Pöttsching Farmers’ Ball and at farmers’ markets, initially in a variety of dirndls with the males dressed in black trousers, white shirts and red neckerchiefs. Eventually the traditional dress of Pöttsching was reproduced by Martina Löffler and Dr. Clara Prickler from Heimatwerk using old photographs. It was made and embroidered by the dancers themselves in 1984 and was presented for the first time at the music festival to celebrate the 15th anniversary of the Pöttsching music society. The men’s traditional dress was made in 1985 based on the traditional costume worn by Peter Zauner. The men’s traditional costume is typical for Burgenland: black breeches and boots, a white shirt, a waistcoat with a collar, a red edging and silver buttons, the last four of which are dress fasteners. The waistcoat is either worn open or with the bottom six rows of buttons fastened. A particularly eye-catching feature is the “Firta”, a kind of apron or cloth worn around the waist by the men, one corner of which is tucked into the waistband at the hip, on the right-hand side for single men and the left for married men. In summer a black hat is added or the head left bare, whilst in winter it is worn with an Astrakhan hat – a sailor’s hat made from karakul wool – and a black jacket. The women’s clothing comprises a black stomacher laced at the front and a white blouse. Girls wear a white skirt with scattered flowers and three blue bands at the hem; older ladies sometimes a dark blue skirt with scattered flowers. This is worn with a blue striped apron and, on cold days, a short black jacket or a shawl. The head is usually left bare. 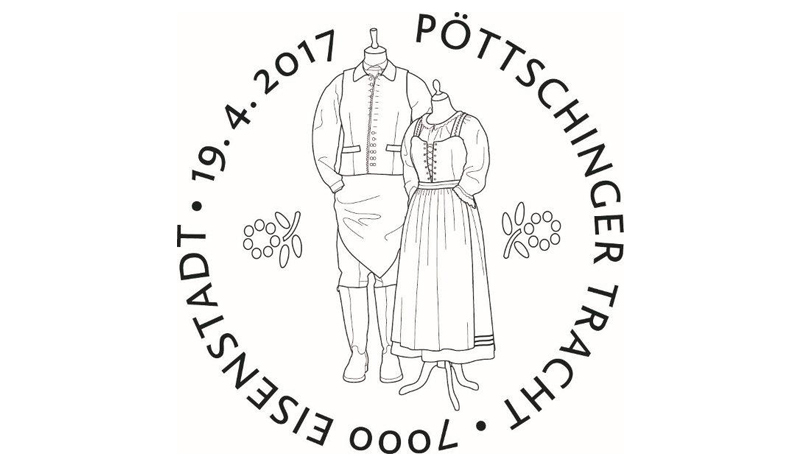 The Pöttsching folk dance group was founded in 1979 and its 20 or so members are committed to preserving traditional customs. It performs at both regional and international folk dance events and demonstrates both the dances of Burgenland and international traditional folk dances.